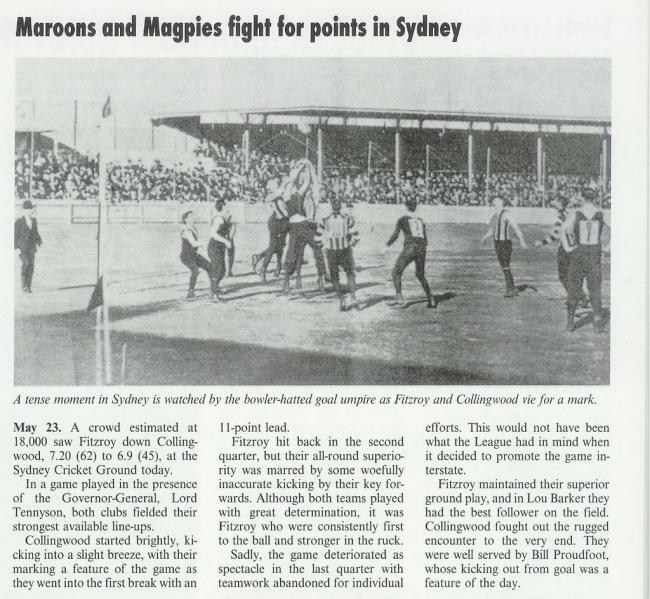 The International Federation of Football History and Statistics, an organization of association football historians, traces the origin of numbers to a 1911 Australian rules football match in Sydney, although photographic evidence exists of numbers being used in Australia as early as May 1903 in a Fitroy v Collingwood match. Player numbers were used in a Queensland vs. New Zealand rugby match played on 17 July 1897, in Brisbane, Australia, as reported in the Brisbane Courier. The NFL has used uniform numbers since its inception; through the 1940s, there was no standard numbering system, and teams were free to number their players however they wanted. An informal tradition had arisen by that point that was similar to the modern system; when the All-America Football Conference, which used a radically different numbering scheme, merged with the NFL in 1950, the resulting confusion forced the merged league to impose a mandatory system of assignment of jersey numbers in 1952. This system was updated and made more rigid in 1973, and has been modified slightly since then. Numbers are always worn on the front and back of a player's jersey, and so-called "TV numbers" are worn on either the sleeve or shoulder. The Cincinnati Bengals were the last NFL team to wear jerseys without TV numbers on a regular basis in 1980, though since then several NFL teams have worn throwback uniforms without them, as their jersey designs predated the introduction of TV numbers. Players' last names, however, are required on all uniforms, even throwbacks which predate the last name rule. As of 2018 season, numbers on shoulders are mandatory, only leaving helmet and pants numbers as optional. In college football and high school football, a less rigid numbering system is employed. The only rule is that members of the offensive line (centers, guards, and tackles) that play in ineligible positions (those that may not receive forward passes) must wear numbers from 50 to 79. Informally, certain conventions still hold, and players often wear numbers in the ranges similar to their NFL counterparts; though the lowest numbers are often the highest prestige, and thus are often worn by players at any position. Kickers and punters are frequently numbered in the 40's or 90's, which are the least in-demand numbers on a college roster. The increased flexibility in numbering of NCAA rosters is needed because NCAA rules allow 85 scholarship players and rosters of over 100 players total; thus teams would frequently exhaust the available numbers for a position under the NFL rules. In association football, the first record of numbered jerseys date back to 1911, with Australian teams Sydney Leichardt and HMS Powerful being the first to use squad numbers on their backs. One year later, numbering in football would be ruled as mandatory in New South Wales. In South America, Argentina was the first country with numbered shirts. It was during the Scottish team Third Lanark tour to South America of 1923, they played a friendly match v a local combined team ("Zona Norte") on June 10. Both squads were numbered from 1–11. March 30, 1924, saw the first football match in the United States with squad numbers, when Vesper Buick and Fall River Marksmen (winners of St. Louis and American Soccer Leagues respectively) played the National Challenge Cup, although only the local team wore numbered shirts. In England, Arsenal coach Herbert Chapman, brought the idea of numbered shirts, worn for the first time when his team played Sheffield Wednesday in 1928. Arsenal wore shirts from 1 to 11 while their rivals numbered from 12 to 22. 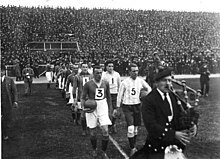 Nevertheless, it was not until the 1939–40 season when the English Federation ruled that squads had to wear numbers for each player. 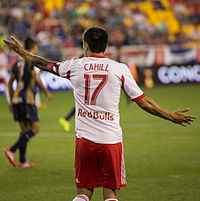 Numbers were traditionally assigned based on a player's position or reputation on the field, with the starting 11 players wearing 1 to 11, and the substitutes wearing higher numbers. The goalkeeper would generally wear number 1, then defenders, midfield players and forwards in ascending order. The 1950 FIFA World Cup was the first FIFA competition to see squad numbers for each players, but persistent numbers would not be issued until the 1954 World Cup, where each man in a country's 22-man squad wore a specific number from 1 to 22 for the duration of the tournament. In 1993, England's Football Association switched to persistent squad numbers, abandoning the mandatory use of 1–11 for the starting line-up. The persistent number system became standard in the FA Premier League in the 1993–94 season, with names printed above the numbers. Most European top leagues adopted the system over the next five years. Very high numbers, the most common being 88, are often reserved and used as a placeholder, when a new player has been signed and played by the manager prior to having a formal squad number. However, in some countries these high numbers are well-used, in some cases because the player's preferred number is already taken or for other reasons. On joining A.C. Milan; Andriy Shevchenko, Ronaldinho and Mathieu Flamini all wore numbers reflecting the year of their birth (76, 80 & 84 respectively), because their preferred numbers were already being worn. Squad numbers first appeared on Australian rules football guernseys when clubs travelled interstate. 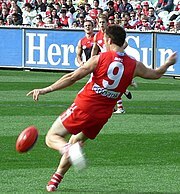 Players traditionally wear numbers on the backs of their guernseys, although some competitions (the WAFL is one example) may feature teams who wear smaller numbers on the front, usually on one side of the chest. The number being worn is usually not relevant to the player's position on the ground, although occasionally a club will allocate the number 1 guernsey or an otherwise prestigious number to the team captain (such as the Richmond football club, which allocates number 17 to its team captain in honour of Jack Dyer, who wore that number with distinction). Port Adelaide assigns number 1 to the team captain. In these situations, it is usually customary for players who relinquish the captaincy to switch to another. In the early years of baseball, teams did not wear uniform numbers. Teams experimented with uniform numbers during the first two decades of the 20th century, with the first Major League team to use them being the 1916 Cleveland Indians which used them on their left sleeves for a few weeks before abandoning the experiment. Again in 1923, the St. Louis Cardinals tried out uniforms with small numbers on the sleeves, but the players did not like them, and they were removed. For the 1929 Major League Baseball season both the New York Yankees and Cleveland Indians put numbers on their jerseys, the first two teams to do so, beginning a trend that was completed by 1937, when the Philadelphia Athletics became the last team to permanently add numbers to their jerseys. Catcher Benito Santiago is the only major league baseball player (or any major professional sportsman) known to have worn a leading zero; Santiago wore the number 09 from 1991 to 1994 in an effort to make his uniform more comfortable. Eddie Gaedel, the midget at the center of an infamous stunt by Bill Veeck's St. Louis Browns, is the only known major leaguer to have worn a fraction (​1⁄8, which he had borrowed from the Browns' batboy) as his jersey number. American basketball leagues at all levels traditionally use single and double digits from 0 to 5 (i.e. 0, 00, 1–5, 10–15, 20–25, 30–35, 40–45, and 50–55). The NCAA and most amateur competitions mandate that only these numbers be used. This eases non-verbal communication between referees, who use fingers to denote a player's number, and the official scorer. In college basketball, single-digit players' numbers are officially recorded as having a leading zero. Teams can have either a "0" or "00", e.g. Portland Trailblazers players Damien Lillard '0' and team-mate Enes Kanter '00'. The rule about "0" and "00" does not apply to the NBA anymore but previously in 2000, Utah Jazz center Greg Ostertag changed from "00" to "39" so Olden Polynice could wear No. 0 and in 2003, Washington Wizards center Brendan Haywood switched from No. 00 to No. 33 so Gilbert Arenas (who had the nickname "Agent Zero" already at this point) could wear #0. However, during the 2015–16 season, the Denver Nuggets played with two players wearing both 0 and 00 (Emmanuel Mudiay and Darrell Arthur respectively), with the Cleveland Cavaliers (Kevin Love and Chris Andersen respectively) and Indiana Pacers (C. J. Miles and Aaron Brooks respectively) continuing the trend the following season. The National Basketball Association has always allowed other numbers from 0 to 99, but use of digits 6 through 9 is less common than 0 through 5 since most players tend to keep the numbers that they had previously worn in college. 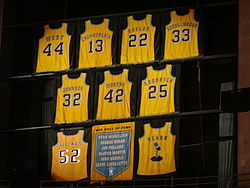 However, with the increase in the number of international players, and other players who have been on national (FIBA) teams who change NBA teams and cannot keep their number with the previous team because another player has worn it or is retired, players have adopted such higher numbers (Patrick Ewing with No. 6 in Orlando). When Michael Jordan retired in 1993, the Chicago Bulls retired his 23; when he came out of retirement he chose to wear 45 until, during the 1995 NBA post-season, he went back to his familiar 23. Also, players cannot change numbers midseason, but they used to be able to (Andre Iguodala and Antoine Wright changed from No. 4 and No. 15 to No. 9 and No. 21 for Chris Webber and Vince Carter, respectively). Since Kelenna Azubuike was inactive all season, Carmelo Anthony was able to wear Azubuike's No. 7 when traded to the Knicks in 2011, but since Rodney Stuckey was active, Allen Iverson could not wear No. 3 when traded to the Pistons in 2009. (Anthony would not have been able to wear his normal No. 15 anyway and would have had to trade jerseys; the Knicks have retired the jersey number). 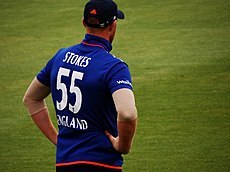 The International Cricket Council does not specifies any criteria for numbering players, so players choose their jersey number by their own. The 1995–96 World Series Cup in Australia saw the first use of shirt numbers in international cricket, with most players assigned their number and some players getting to choose their number, most notably Shane Warne wearing 23 as it was his number when he played junior Aussie rules for St Kilda. Other countries soon adopted the practice, although players would typically have different numbers for each tournament, and it was several years later that players would consistently wear the same number year-round. Ricky Ponting (14) still uses the same number as in that initial season. Player numbering was first used in the 1999 Cricket World Cup, where the captains wore the number 1 jersey and the rest of the squad was numbered from 2 to 15. An exception was that South African captain Hansie Cronje retained his usual number 5 with opener Gary Kirsten wearing the number 1 which he had also done previously. For Gaelic football and hurling the GAA specifies that players must be numbered from 1 to 24 in championships organised by the body. In camogie, the Association does not specify any criteria for numbering. Beyond of that, in gaelic sports goalkeepers generally wear the number 1 shirt, and the rest of the starting team wears numbers 2–15, increasing from right to left and from defence to attack: substitutes' numbers start from 16. According to the International Handball Federation, numbers from 1 to 99 can be used. The field player has often the other numbers from 1 to 20. Sometimes the players has also the last two digits of the year of their birth. In field hockey, the International Hockey Federation (FIH) does not specify a criteria for numbering players. Nevertheless, in the 2018 Men's and Women's World Cup, the 18 players of each squad were numbered 1–32, with number "1" generally given to goalkeepers, with some exceptions such as Canada men's, with forward Floris van Son or India women's with midfielder Navjot Kaur, both wearing that number. In other hockey competitions controlled by the FIH, a similar numbering system (1–32 for squads made up of 18 players each) has been applied, such as the 2016 Summer Olympics for both, men's and women's squads. This systems kept for the last men's and women's Champions Trophy held in Breda and Changzhou respectively. The very first jersey number to be retired in professional sports was that of an NHL player, Ace Bailey, whose #6 was retired by the Toronto Maple Leafs in 1934 following a career-ending fight with Eddie Shore during a game against the Boston Bruins in 1933. Shore injured Bailey under the mistaken impression that Bailey had hip-checked him when it was actually fellow Maple Leaf Red Horner. To aid Bailey, the NHL hosted a benefit game between the Maple Leafs and an all-star team, at which Maple Leafs owner Conn Smythe retired his number. Over time, the number 1 became less common among goaltenders, with only seven using it as of December 2016. One reason was that goaltenders increasingly followed the example set by the Toronto Maple Leafs' Terry Sawchuk and the Montreal Canadiens' Patrick Roy after the NHL mandated that each team have two goaltenders in every game. In 1964, Sawchuk joined the Maple Leafs wearing 24 as the number 1 was already being used, but switched to 30, whereas Roy donned 33 as his team already had a player with the number 30, starting a trend of goaltenders using numbers in the 30s. Furthermore, seven franchises have retired the number 1—six in honor of players, and the Minnesota Wild in honor of its fanbase—making it unavailable. As a result, fewer goalies have chosen the traditional number 1 and instead have opted for more distinctive numbers, or numbers of their favourite goalies. Notable examples include Corey Crawford wearing 50 for the Chicago Blackhawks, Braden Holtby wearing 70 for the Washington Capitals, Sergei Bobrovsky wearing 72 for the Columbus Blue Jackets, and Andrei Vasilevskiy wearing 88 for the Tampa Bay Lightning. In most auto racing leagues, cars are assigned numbers. The configuration of stock cars, however, makes the numbers much more prominent. (Aerodynamic open-wheel cars don't have nearly the amount of flat surface that a stock car has.) Numbers are often synonymous with the drivers that carry them. Dale Earnhardt Sr. is associated with the number 3 (although that number is actually associated more with its owner, Richard Childress, who has taken the number out of reserve for his grandson Austin Dillon, first in the Truck Series, then in the Nationwide Series, and finally in the Cup Series beginning in 2014), while Richard Petty is associated with Number 43, Wood Brothers Racing with Number 21, and Jeff Gordon to the Number 24. In NASCAR, numbers are assigned to owners and not specific drivers. Drivers that spend a long time on a single race team often keep their numbers as long as they drive for the same owners. When drivers change teams, however, they take a new number that is owned by that team. Jeff Burton, for example, raced for three teams from 1994 to 2013, and had four numbers in that time. In 1994 and 1995 he raced the Number 8 car, then owned by the Stavola Brothers. From 1996 to mid-2004 he raced for Roush Racing, and drove the Number 99 car. After leaving Roush Racing for Richard Childress Racing, he changed to car Number 30 (for the rest of the 2004 season) and drove Number 31 (also an RCR car) from 2005 to 2013. The Number 99 car he used to drive for Roush was driven by Carl Edwards from 2004 to 2014. When Dale Earnhardt Jr., having raced under Number 8 at Cup-level moved from DEI to Hendrick Motorsports he attempted to take the number with him. When that failed Hendrick was able to secure the Number 88 from Robert Yates Racing. Formula One car numbers started to be permanently allocated for the whole season in 1974. 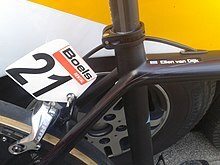 Prior to this numbers were allocated on a race-by-race basis by individual organisers. From 1974 to the mid-1990s, the numbers 1 and 2 would be allocated to the reigning world champion and his teammate, swapping with the previous year's champions. Once numbers had been allocated, teams retained the same numbers from year to year, only exchanging for 1 and 2 when the drivers' World Championship was won. As a result, Ferrari are infamous for having carried 27 and 28 for many years (every season from 1980 to 1989, and then again from 1991 to 1995), these numbers having originally been allocated to new entrant Williams in 1977 and passed to Ferrari when Alan Jones replaced Jody Scheckter as World Champion after the 1980 season. Numbers were reallocated occasionally as teams departed and joined the series, but this scheme persisted until the late 1990s; one team, Tyrrell, kept the same numbers (3 and 4) throughout this period for every season from 1974 to 1995. In floorball, all players are required to have number 1–99 on their jersey, but goalies are the only players who can wear number 1. In volleyball competitions organised by the FIVB, players must be numbered 1–20. Retiring the uniform number of an athlete is an honor a team bestows on a player, usually after the player has left the team, retires from the game, or has died. Once a number is retired, no future player from the team may use that number, unless the player so-honored permits it. Such an honor may also be bestowed on players who had their careers ended due to serious injury. In some cases, a number can be retired to honor someone other than a player, such as a manager, owner, or a fan. For example, the Boston Celtics retired the squad number 1 in honor of the team's original owner Walter A. Brown. In association football, the practise of retiring numbers started in the 1990s, when clubs assigned permanent numbers for their players, first in European Premier League or Serie A and then in South American leagues such as Argentine Primera División. Nevertheless, associations such as CONMEBOL have squads numbering rules that don't allow the retiring of numbers. Moreover, some South American teams (such as Universitario de Deportes or Flamengo, and even Mexican teams invited for the occasions) have occasionally had to re-issue their retired numbers for special cases due to CONMEBOL rules for club and national team competitions (Copa Libertadores, Copa América). ^ "Football - New Zealand v. Queensland" (scan). The Brisbane Courier. Vol. 54 (Issue 12, 828). 17 July 1897. pp. 6, col. 3. Retrieved 29 November 2014 – via trove.nla.gov.au. ^ "Chapman's Innovations". Arsenal F.C. Archived from the original on 28 May 2008. Retrieved 29 June 2008. ^ Schonbrun, Zach (31 March 2015). "College Basketball Players Can't Wear 6, 7, 8 or 9". The New York Times. .